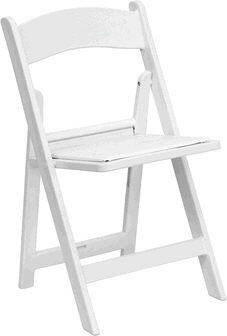 The White Resin Folding Chair combines comfort and elegance that looks good at all of your special events, whether it's a backyard BBQ, a formal banquet, or wedding. This chair is made from ultra-strong resin that's very lightweight, yet extremely durable. * Please call us for any questions on our chair white resin w/ padded seat rentals in Pipersville PA, Hatfield PA, and Bucks & Montgomery Counties in Pennsylvania.